Our selection of 38-meter concrete boom pumps offers small to mid-size units versatile enough to tackle both commercial and residential applications. We carry four-section and five-section Z and Multi-Z booms with 360-degree continuous rotation for exceptional productivity. With over 5,000 psi hydraulic system pressure and 209 yd3/hr rod side and 141 yd3/hr piston side output capacity, these concrete boom pumps deliver professional-quality performance and results while eliminating labor requirements and streamlining processes. 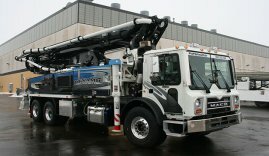 These lightweight and compact truck-mounted concrete pumps provide the maneuverability to work in tight and confined construction sites and busy urban areas. The boom design allows for low-profile folding and unfolding for the ability to work inside structures and below overhead obstacles. With a verticle reach of 121 feet, 9 inches and a horizontal reach of 108 feet, our concrete boom trucks allow us to accurately place concrete at elevated positions without the use of buckets, wheel barrels and cranes. Commercial contractors, construction companies and builders utilize 38-meter concrete boom pumps to speed up their concrete pouring and placing operations. These units are an excellent choice whether you are working in an office complex, retail mall or residential construction project. From filling large slabs and foundations to pouring concrete for driveways, sidewalks, patios, parking lots and swimming pools, these boom pumps are designed to optimize efficiency. Dynamic Concrete Pumping, Inc. offers a complete range of concrete contracting services including pumping, finishing, polishing and more. Contact us for more information and to request assistance from a live representative.